Back with an all new style, the Nitecore TINI SS is the revamped version of Nitecore's best-selling keychain flashlight! Featuring a CREE XP-G2 S3 LED, this surprisingly powerful light can emit up to 380 Lumens, the perfect amount for everyday chores like walking the dog or taking out the trash. However the real story with these all new SS versions is the colorful stainless steel bodies. Available in Jet Black, Glacier and Tropical, these stainless steel lights are just as much a fashion statement as they are a reliable EDC keychain light! As with other TINI models, the Nitecore TINI SS includes an integrated Li-ion battery pack which is USB rechargeable. The pack features 280mAh capacity and can be charged via any computer, laptop or wall mounted USB port. 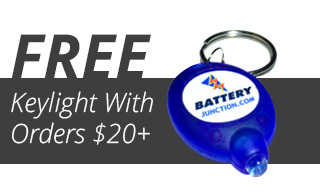 USB charging makes it easy to keep your favorite key chain light powered up wherever you go. The classic dual switch interface makes switching the light on and off, as well as shuffling between modes just as easy - an ideal experience for anyone that wants a powerful and straightforward EDC. This is the third Nitecore Tini that I have purchased from BJC. I was so happy with the first, I now have one on almost all our keychains. All function perfectly, pack a powerful punch for such a small package, and they're rechargeable. It's a great keychain light. The new finishes awesome also. I know it's wrong, but I love when my curious co-workers pick up my keychain off my desk to check out the Tini. I warn them, but they still have to look directly at it. Hello big blue dot !